Acclaimed Canadian artist Moyra Davey published her perennially relevant Mother Reader in 2001. Now, she reveals how motherhood continues to affect her art. Moyra Davey's Mother Reader: Essential Writings on Motherhood grapples with questions of art and motherhood in nuanced and complex ways. Why are women such patsies? Are mothers discriminated against in the art world because they have children, or simply because they are women? Or is daring to have more than just one child the real danger for female artists? These are just some of the salient, and perennial, questions raised by artist and writer Moyra Davey’s book Mother Reader: Essential Writings on Motherhood. Included are Sylvia Plath’s and Margaret Atwood’s remarkable accounts of giving birth, Ursula K. Leguin’s nuanced lecture on society’s reductive notions about women writers, Alice Walker’s cogent critiques of white feminists’ approach to the female imagination, and Lynda Schor’s darkly humorous piece of short fiction about a mother who suffers a fatal stroke one morning—but who is not permitted, either by others or by herself, to actually die until she has fulfilled all her household and parenting tasks for the day. Now, with a Toronto lecture coming up May 4 as part of York University’s Joan and Martin Goldfarb Summer Institute exploring “Slowness, Not Sedation,” and a show ongoing at Murray Guy in New York, Moyra Davey talks with Leah Sandals about mothering, reading, writing and more. Leah Sandals: Your recent essay for Greengrassi was composed, in part, in response to questions that have come up over the years about Mother Reader—like what else you would want to include in it—as well as in response to your experiences of your child moving out to college last year. How do you feel about Mother Reader now, 15 years since its publication, as well as some six months on from writing that Greengrassi essay? Moyra Davey: I started the process for Mother Reader at least 2 years before it was published, too. So it’s an odd feeling. This relationship that you have with your partner and your child, it’s this triangle, and suddenly one leg of the triangle leaves, and everything is destabilized psychically. And you really have to get used to it. It’s a very odd feeling. I was really emotional at first when my son left, but it’s getting easier. LS: Having a child is a transition, and having them leave is a transition, too. How do you address that? MD: Well, there was definitely a sort of retrospective glance in the Greengrassi show. I actually made a work that included a piece I made while I was pregnant—a photo of myself pregnant that I had never shown. I re-photographed it and made a new piece. The video that I’m working on now is called Hemlock Forest, and a passage from that text, Mothers, is in the narration of Hemlock Forest. I find it’s a very tricky thing to address, because, as I say in the essay, empty nest is this big cliché—yet I have very strong feelings in relation to it. So it’s tricky to write about it, it’s tricky to talk about it. I’m still looking for ways to do that, I think. LS: Some 18 years ago, you were also dealing with a situation that was also regarded as cliché—being a new mom. Did that make it difficult to make art about? MD: Well, I didn’t make art about it, I don’t think. I made that one photograph, but I never showed it. I edited Mother Reader; I think that was my way responding to it, perhaps. It was a process, you know. I loved being pregnant, but I don’t think that I made any art about it except that one piece. LS: I understand that lack of production on this theme could have been for any number of reasons. Yet I guess I wonder, myself, if the idea of it being cliché had something to do with that lack. The interesting thing about it, I’ve always found, is that pregnancy and motherhood is this utterly universal phenomenon. I mean, obviously, it happens very differently in different places. Still, one could say it’s completely universal. But it feels so singular, too, to each person. How does one negotiate that? As a writer, as an artist? I think that was one of the reasons I wanted to edit Mother Reader: because I had come across all of these incredible examples of women doing just that [negotiation], and I had this vision of bringing them together. LS: I’m very grateful that you put so much effort into bringing Mother Reader to fruition. Even with writers that are really well known, like Margaret Atwood, I probably wouldn’t have come across that short story of hers, “Giving Birth,” very easily on my own. How did reading all those texts in the book—including the pieces of short fiction that had artists as protagonists—affect you? MD: I think that editing Mother Reader, and doing so much reading, and writing that introduction, did change the way I work as an artist. I think it solidified my relationship to literature and it made writing—which hadn’t been central to my work before—more central to what I do. The work is this kind of triangulation of writing, video, photography. They are always happening together, and one stimulates the other. So that’s been a really fantastic offshoot, and I think that comes directly out of the process of spending two years so entrenched in reading in order to produce Mother Reader. Now I’m working on a new piece which is, in part, about Julia Margaret Cameron, who was famously a mother of six children and was given a camera by her eldest daughter when she was 48. I never say that motherhood directly affected the way I work; I guess it indirectly affected the way I work in that it led me to editing Mother Reader and then to continue writing as a result of that. LS: What enjoy, both with the cover of Mother Reader—which shows a kind of playpen screen next to a packed bookshelf—and with your newer works like the video Notes on Blue, currently on view at Murray Guy in New York—is how a rigorous intellectual and artistic engagement is clearly placed within the domestic space of the home. Can you talk about that a bit? MD: All of my videos are shot in my apartment, pretty much. It’s an interesting thing—I have never liked working in a studio. And I don’t think I’m alone in this, actually. I have had studios over the years, and I have always had to force myself into them. I’ve always found it a rather alienating space, and I have always preferred to work at home. That includes all the different rooms of my home: the kitchen, the bathroom, the living room. When we moved here, I had the biggest room in the apartment as my so-called studio, and then when my son got to be a little bit older, I decided to give him that room because I thought it was important for him to have. So I gave him the room and my husband and I shared a room as a kind of office space that was super-cramped. Now that Barney has gone to college, I have been moving back into this room. It really is a lovely room. It faces south, it has two windows, it gets tons of sunlight. So it’s this funny, sort of circular, thing. It’s its own kind of moving back to where I started in relationship to him and the room. LS: I want to touch on slowness, which is the theme of the lecture series you’re participating in on May 4 in Toronto. I’m on the early end of the parenthood experience, and having a small child has definitely slowed me down in a lot of ways. Did a similar experience influence your thoughts and feelings on slowness? MD: I’ve never actually thought, to be honest, about slowness. Other people have gotten that from the work, and experienced it, and written about it, but it was never something that I actually thought about. And having a child, unfortunately, didn’t slow me down. I wish that it had. I wish that I’d been slower and more patient, but I was always just kind of desperate to get back to work. That’s a really tough thing, that’s a huge conflict—and of course, that’s what a lot of of Mother Reader is about, that kind of struggle that artists and writers have. I did make some photographs that definitely speak to slowness, and I will showing those in the Toronto lecture. They are the result of spending a lot of time, literally, crawling around on the floor with a child. I was taking photographs of the view under the bed. And I also didn’t have a tripod at that time, because we had moved so many times, and a lot of my belongings were in storage, including my tripod. So I would put my camera on the floor to stabilize it. So, indirectly, there are some photographs about going through a process of being slowed down by a child—I guess you could say that. LS: To finish, a question that probably oversimplifies a complex phenomenon: Do you have advice for people who are struggling with being a parent, or with trying to engage in creative work while being a parent? MD: I don’t know what to say, because I think for certain artists and writers, making their work is absolutely essential to their psychic well-being—and then they have a child, and the child makes it really difficult to work, and it’s this enormous struggle. Part of me thinks, in relation to myself, “Oh you should have just put your work aside for four or five years, and given yourself over to the child, and enjoyed the child, and given up on this struggle.” But, at the same time, I could not do that, so it’s a total conundrum to me. Psychically, I could not have done that; I think I would have sunk into a terrible depression. I wish I had advice, but I don’t have advice, because I don’t know what the answer is. It’s a tough question. Moyra Davey speaks May 4 at the Art Gallery of Ontario in Toronto as part of York University’s Joan & Martin Goldfarb Summer Institute in Visual Arts. Her Mother Reader is available for purchase through various booksellers. 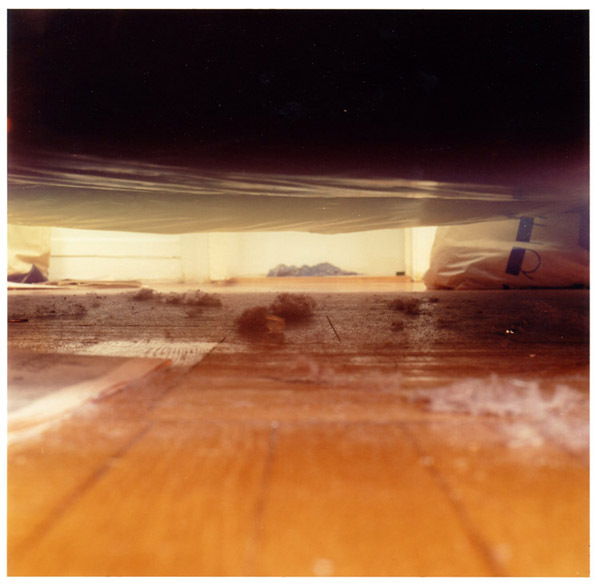 And the exhibition “Moyra Davey: 7 Albums” continues until May 21 at Murray Guy in New York. Leah Sandals is news and special sections editor at Canadian Art. She has also written for the Toronto Star, National Post and Globe and Mail, among other publications. She welcomes tips, corrections and comments anytime at leah@canadianart.ca.